To many in the military, dogs became welcome companions. 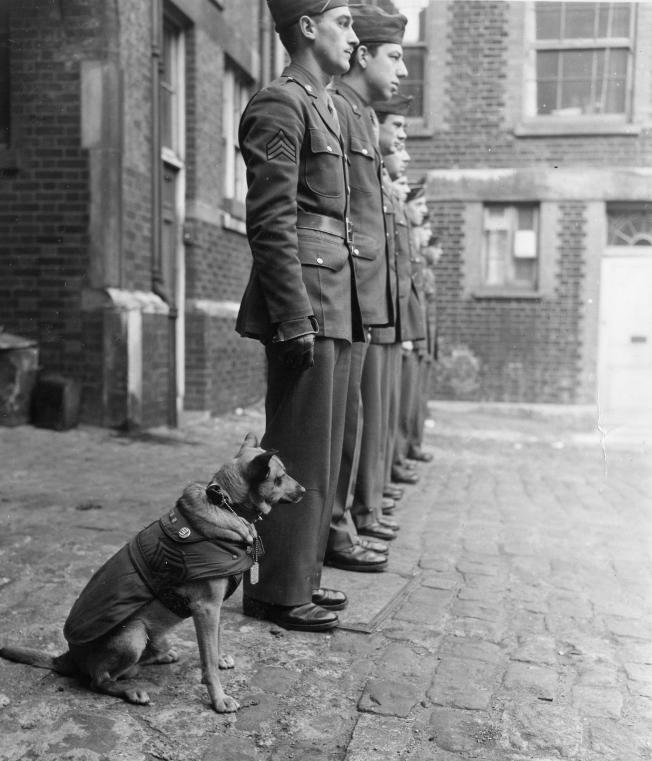 Below you'll find World War 2-era pictures of the pets who were promoted to mascots. American men left behind a great deal when they left home to fight in World War 2. They lost their identities, their families, and almost all their worldy goods, but they improvised as best they could. Oceans away, they either quickly adopted dogs or gave in when canines attached themselves to their units. These “military dogs” provided an immense morale boost, caring for their masters with unconditional love. They reminded servicemen of home, provided them with companionship, and brought them peace. The masters easily returned their new pets’ loyalty. This German Shepherd, named “Jaint de Motimorency,” poses with his owner, Lt. Peter Baranowski. 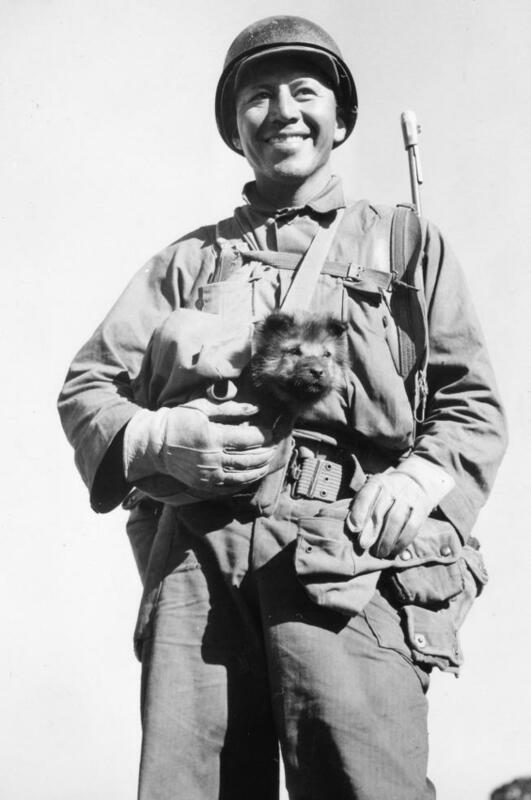 If you look, paratrooper Baranowski’s companion bears the U.S. flag paratrooper insignia; he was the only dog to have actually jumped into combat with American airborne forces. Sgt. Bea Alcoze of Ft. Worth, Texas, carries his canine companion along a hike to his unit’s position near Burma Road, as part of the Mars Task Force in Ho-Pong. Known for being the best-dressed canine on the post, “Black Pepper” was the mascot of Enl. Det. 1861st Unit. Black Pepper could often be seen out for his early morning exercise under the supervision of P.F.C. Joe Frisella. 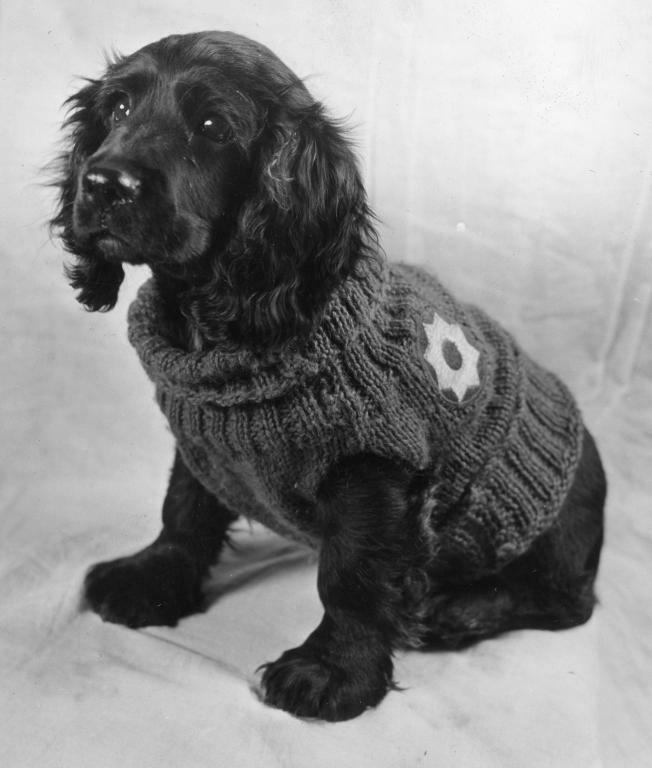 His sweater, bearing the insignia of the Eighth Service Command, was knitted by Mrs. P.N. Wells of Little Rock, Arkansas. 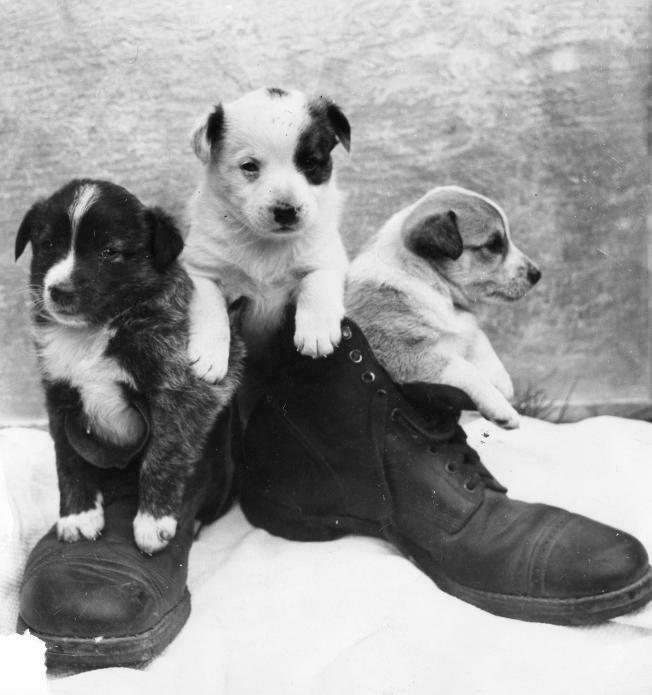 These military boots insulate a different set of dogs: couresty of the 9th Svc. in Fort Douglas, Utah. This photo shows “Jumper,” ironically named because he didn’t get to make the jump along with his paratrooper pals. To Jumper’s left is paratrooper George R. Vespa of the 11th Airborne Division. The two said goodbye to one another before Vespa left for the Luzon Island jump. 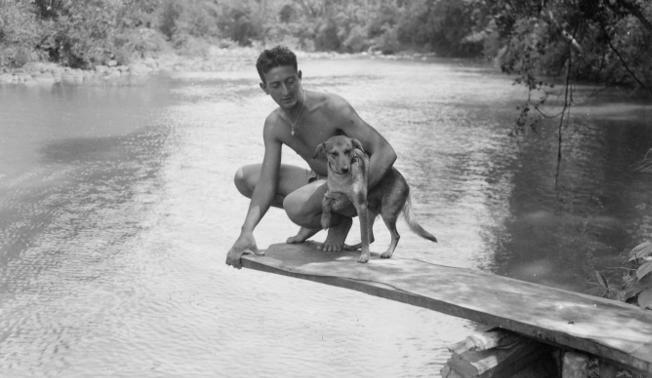 Here, Private Samson and his pal “Chips” pose on a makeshift diving board, built by his outfit for their mountain swimming hole. This photo depicts P.F.C. 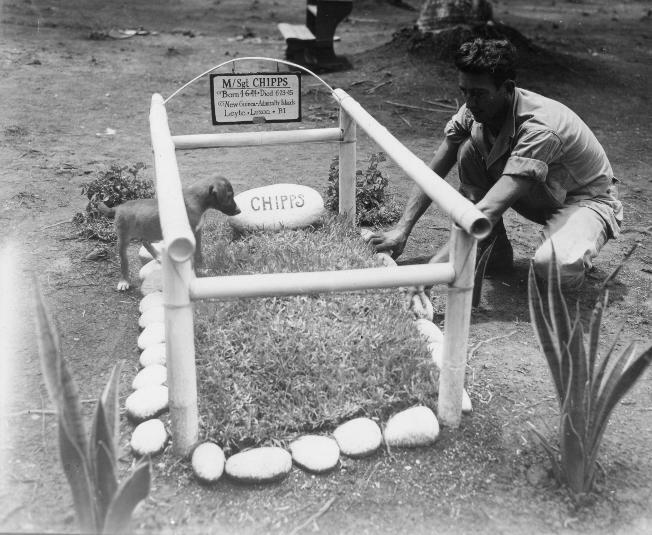 Joseph Samson of the 1st Signal Troop, 1st Cavalry Division at the “grave” of his pet dog, “Sergeant Chipps,” while Chipps looks on with interest. The grave served as a memorial to the four campaigns on which Chipps accompanied the 1st Signal Troop. Sgt. Joe Kodachrome, or “Sgt. Joe” to the men in his outfit, falls in at attention with the rest of his group. Dog tags polished, resplendant in his G.I. coat, his uniform is complete with an ETO ribbon. Prior to this picture, Sgt. Joe completed a full year of active duty and jokingly awarded the “order of spam” for his meritorious service. 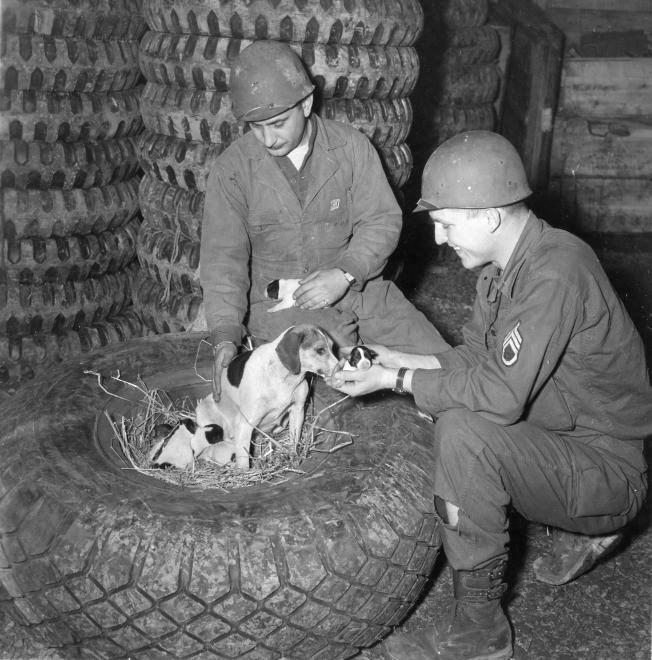 A tire shortage begrudgingly coaxed the mascot of the 766th Light Main, 56th Division, out of her temporary quarters where she just had a litter of pups. To the left and right are Cpl. Joseph Gabriel and Sgt. Troy Greene, respectively, inspecting the unit’s newcomers. 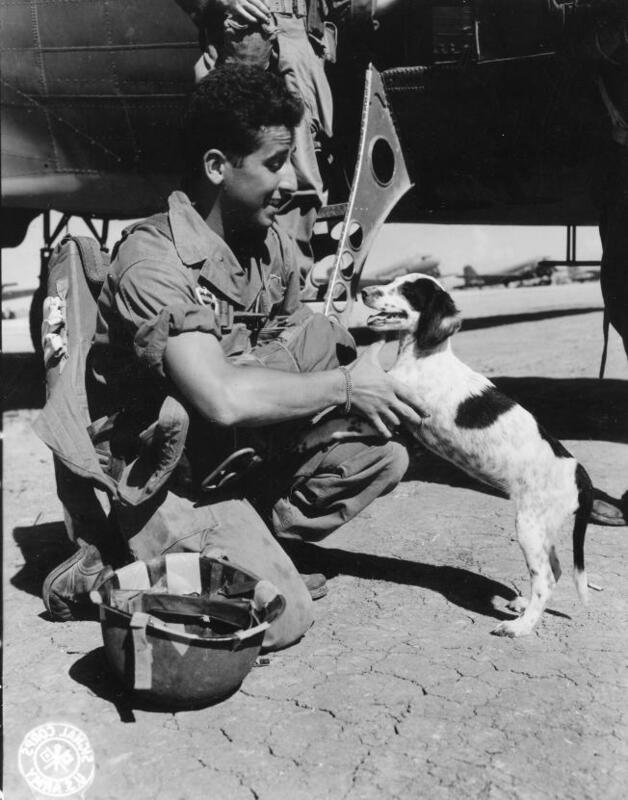 In serving with the Allies, military mascot “Lucky” proved to be anything but. 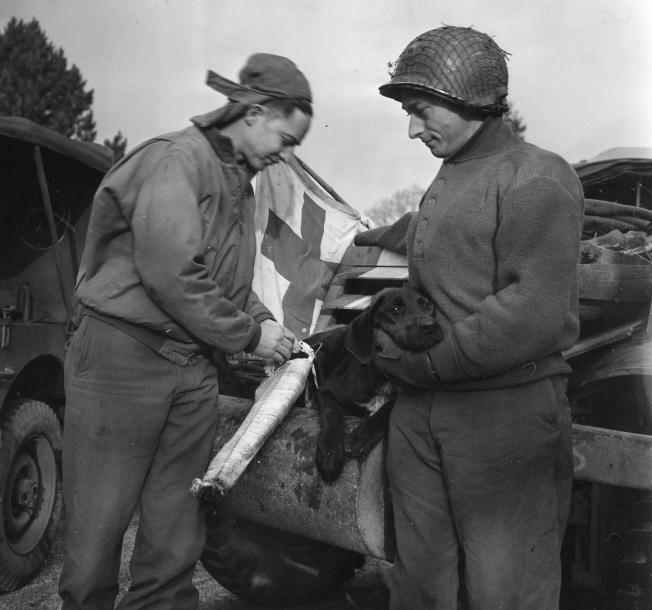 After sustaining a fractured leg in Belgium, Corporal Jerry Byars fixes him up with a splint. Byars, a former veterinarian, is seen here serving with a cavalry reconnaissance squadron of the VII Corps. Looking on is Sgt. Fred Lederman of Newark, New Jersey. Did you enjoy these photos? 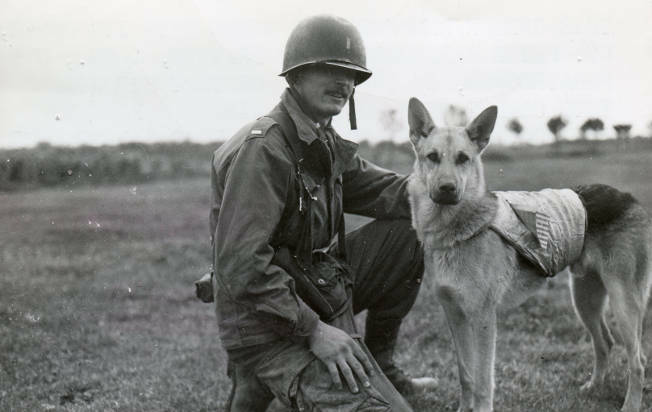 Get a look at some of the rest in our companion article, “A Hard Mutt’s Life.” And of course, you can see our complete photo essay of military dogs at war in the April 2015 issue of WWII History Magazine. To take a look at pictures from the experimental U.S. Army “Parachute Animals” program, click here. Here you can learn about the U.S. War Dog Association, the U.S. non-profit dedicated to educating the public about the invaluable service of these canines to our country. Tags airborne, Belgium, Burma, Dog Tags, Military dogs, pictures of pets, World War 2 pictures. That is my Father George Vespa. We always had 2 dogs throughout his long life he died at age 92 a couple of years ago. Thank-you for this wonderful picture. he would have loved to have seen it.